Our Sturgeon Fishing Report aims to be your number one resource for the latest up to date water conditions, bait we are using and on the water highlights. Conditions are constantly changing, as such it's always best to keep informed of what's going on before you head out as this enables you to increase your odds of hooking up. Spring is here, the weather is fantastic, and the river is on the rise. With the rising river comes the first feast of the season for the Sturgeon. The Eulachon are smelt that run up the river in April and May. Sturgeon gather to feast on these fish along with seals and birds. Sturgeon even enter the river from the ocean following this run of smelt. With this food source comes fantastic fishing. We’ve been averaging as few as seven and as many as 20 fish a day. Sturgeon become quite aggressive as the feeding frenzy commences. The bites are hard with no hesitation , and the action is steady. This action should last through May until the Eulachon run has ended , and even past the end of the run. If you’ve been thinking about getting out, now it’s a fantastic time. The weather is good, the fishing is great, and we have a spring special on. 4 people for $675 plus tax. Regular price is $750 plus tax. Great fishing has continued on into the fall. Fishing in October and November has been nothing short of fantastic with multiple hookups a day being the norm. There have been a lot of nice size fish as well, with suspicion the six to eight foot range on a daily basis. The weather has been a little colder, but our boats come equipped with fully enclosed tops and heaters, so everybody stays nice and toasty throughout the day. Good fishing will continue right through December which makes a fishing trip the perfect Holiday Gift. Bait of choice has been salmon eggs. There’s a lot of spawning salmon in the river and the sturgeon are keying in on the eggs. Just yesterday I had some clients out for a four hour trip , and we hooked up with four beauties plus many other bites. One of the fish was over 220 lb and the other was over 250 lb. I think it’s safe to say that both anglers went home with sore arms and big smiles. Providing people with experiences like this is what it’s all about for me. Come join us and find out for yourself or feel free to check out our other informative pages on Fraser River Sturgeon Fishing. 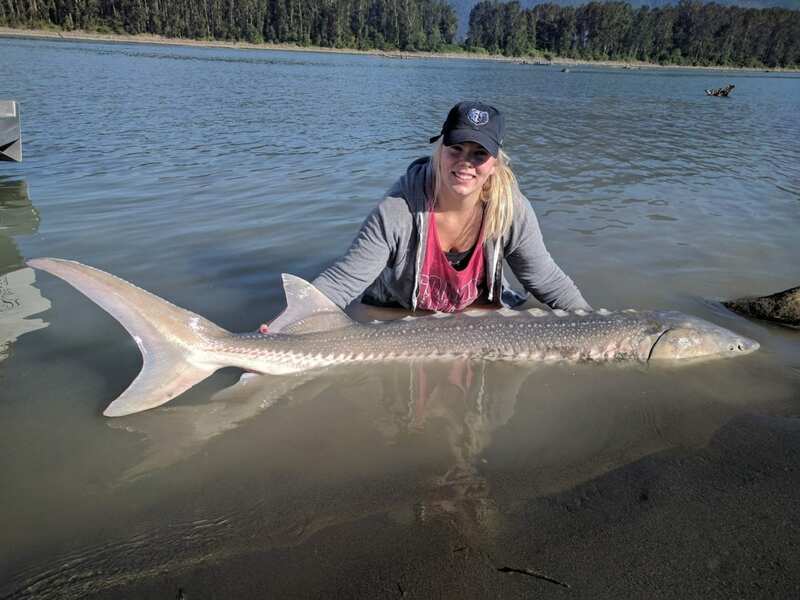 Sturgeon fishing on the Fraser River remains consistent. They have been taking a variety of baits but salmon meat seems to be the most consistent producer. We have been catching some absolute brutes as well. Quite a few fish over 8′ with ridiculous girths. We just got one the other day that calculated out to 391 lbs. Seeing a fish of this magnitude come flying out of the water is a sight to behold. Sturgeon fishing should pick up anytime now as they begin to fatten up for winter. Salmon fishing has picked up considerably as well. Chum fishing has been really good, as has the coho fishing. We target the salmon with jigs and spoons and spinners. Now is the time of plenty, and it will continue into November. Also, feel free to check out our other informative pages on Fraser River Sturgeon Fishing. Sturgeon fishing has remained consistent, with an average of 4 – 7 fish a day. A lot of nice size fish being caught, the average has been around a hundred pounds. With fish in the seven to eight foot range being caught daily , which average anywhere from 200 to 300 lb plus. Last fish we caught the other day calculated out at 354 lbs. It was 97 in Long , with a girth of 47 in. The fishing is about to pick up as we head into October. October, November is the last Feast before winter, winter is famine and the fish know it. November in particular has some fantastic fishing for both salmon and sturgeon. A lot of people Overlook November, but if you’re looking for less crowds and killer fishing November is the time. The weather can be questionable, but our boat is fully enclosed, and we have a heater inside so everybody stays toasty. We still have dates available in November, so drop us a line if you’re looking to catch a beast. Sturgeon fishing has slowed a little, but remains consistent. last several days have been catching six to nine fish a day, and lots of nice size fish. Average size is just over 5 feet ,roughly 100lb and some fish over 200 pounds on a daily basis. We had some clients from Germany who are lucky enough to catch a 450 lb monster. 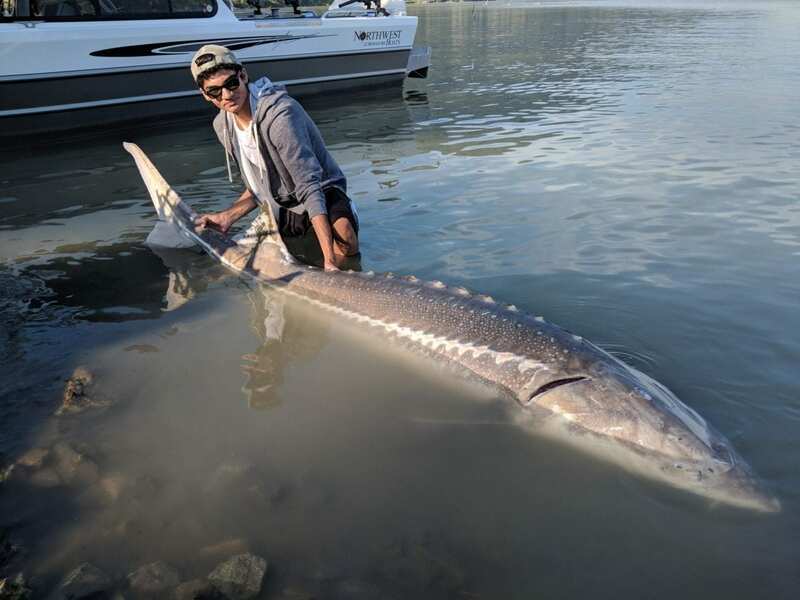 This fish was 101 inches long with an astonishing 53 inch girth. This monster of the deep cleared the water three different times when hooked. If you’ve never seen a 450 lb fish jump clear out of the water when it’s on your line, then you need to come and go sturgeon fishing. It is truly a heart-stopping experience. The Fraser River also has a healthy run of Chinook salmon coming through right now. We’re also catching those every time we fish for them. These are large fish and you have an excellent chance of catching one over 30 lb. The average size of these Chinook is 12 to 18 pounds. They are aggressive biters and hard Fighters. Everything you could ask for in a salmon. If you’re looking to get yourself a trophy salmon sturgeon, now is the time. September through October is going to see some excellent fishing for both salmon and sturgeon. Sturgeon fishing remains strong and we are still averaging 4-9 fish a day. 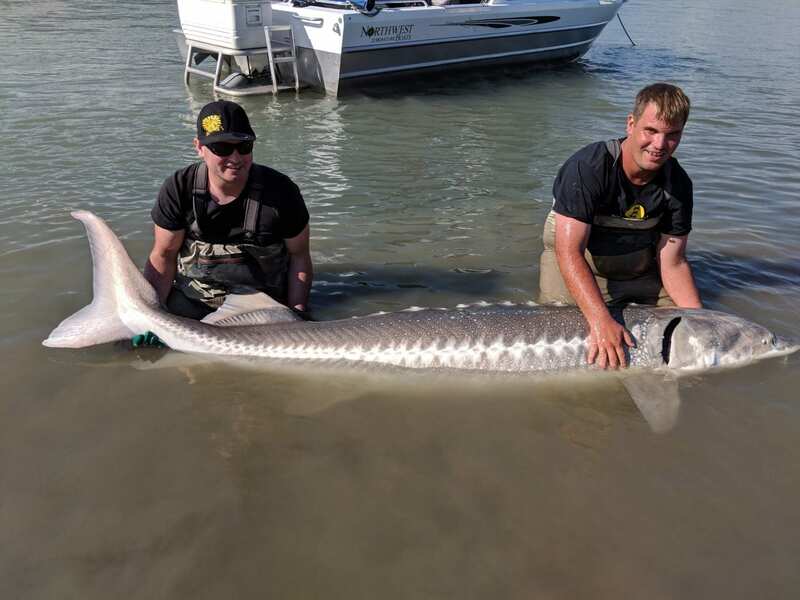 The sizes have still been good with an average size of a hundred pounds or more , roughly 5 to 6 ft. With the water temperature the way it is, the sturgeon are fighting particularly hard. There’s lots of food around and they seem to be hungry. We had one gentleman and his wife all the way from Holland , who managed to get several fish in the seven foot range and one 8-footer , along with several five Footers all in 2 days. I would Hazard a guess that he went home with sore arms. We also had one fish that tore off almost 200 yards of line in one shot. I expect this fishing to continue on into September , and it will only get better right through October. If it’s big fish or after now’s the time. Come and get your sturgeon freak on! We have been hooking 6-8 fish a day, with very few fish under the five foot mark. We have been catching fish in the 7-8 foot range on a daily basis. Which has made for some very happy clients! The Sturgeon have been quite acrobatic lately, almost every fish we have hooked has been jumping clear of the water. If you’ve never seen a 300lb fish clear the water on the end of your line, it can be a heart stopping experience. 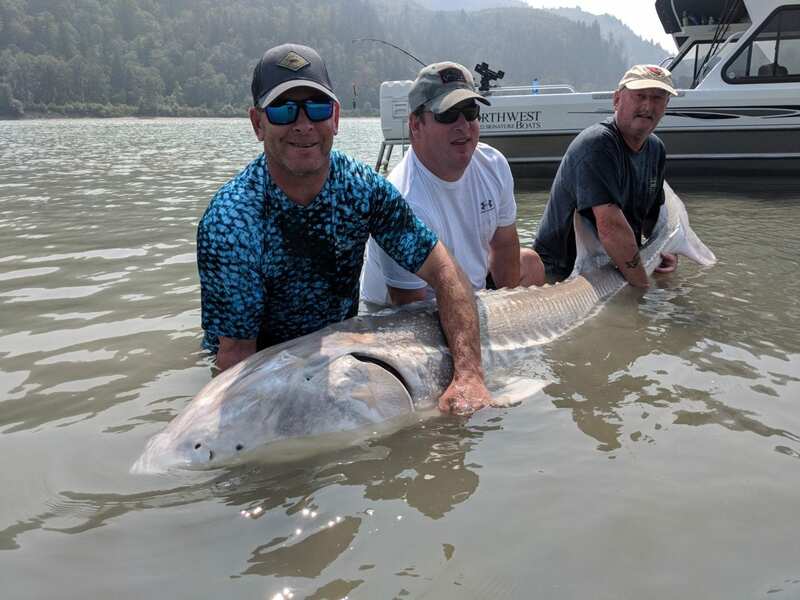 August 2017 was a spectacular month for Sturgeon fishing on the Fraser River. My fishing guests are enjoying my new boat and the fish seem to be as well because they are really biting! We’ve also had many visitors from around the world come and fish with us. 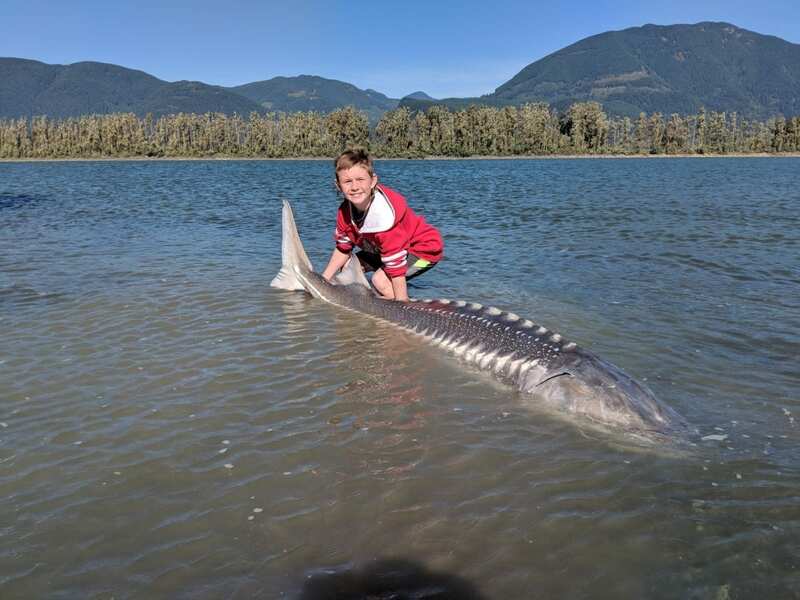 British Columbia is really getting known to be the Sturgeon fishing hub of the world! The amazing sunny weather continued through the month with minimal rain or clouds. Here are some of our recent catches. I had a great time fishing with this couple and they had 2 epic battles with 6.5 and 7.5 sturgeon! There were again multiple dinosaurs caught by this group and they finished off the day off with a 7’8″. I think these gents slept well that night This was a feisty 7.5’ sturgeon that put up a great fight. These gentlemen were so surprised at the strength of the fish This was just one of the beautiful dinosaurs that this lady caught on her day out fishing on the Fraser River. 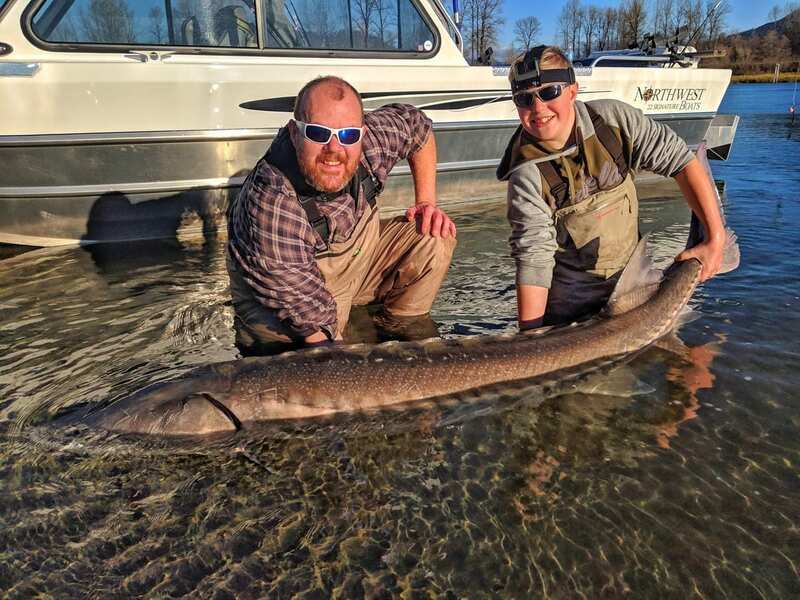 Some great teamwork from this father and son dual resulted in a multiple sturgeon day including this monster If you haven’t tried sturgeon fishing you must put it on your list. It’s an experience of a lifetime and I can show you all the ins and outs of the Fraser River. Contact me for more details! Sturgeon fishing has been relatively consistent so far this year. Creating some lasting memories and sore arms. Four buddies got together and had an epic day of sturgeon fishing. It’s amazing how a fishing trip will strengthen the bonds of friendship Some happy memories were made for these visitors from Ontario. 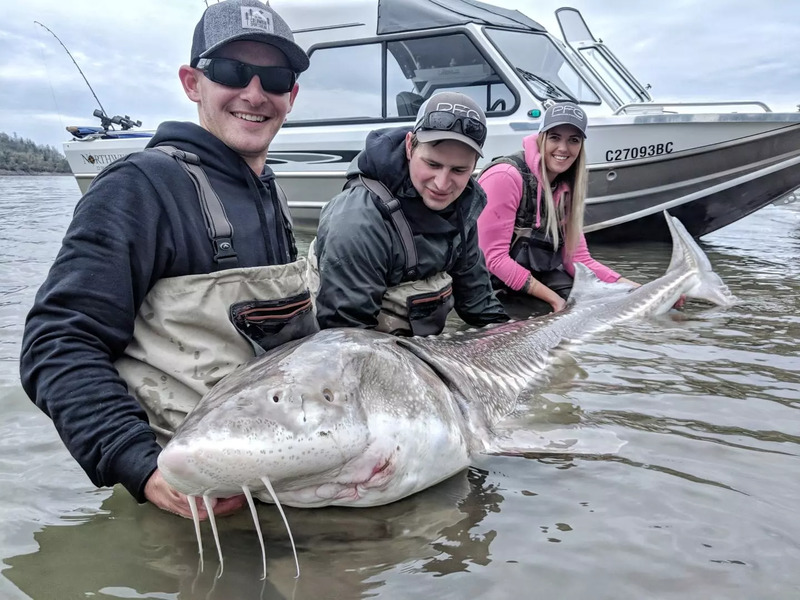 They fulfilled their dream of catching a trophy sturgeon. Here’s a close up view of a boat side release. 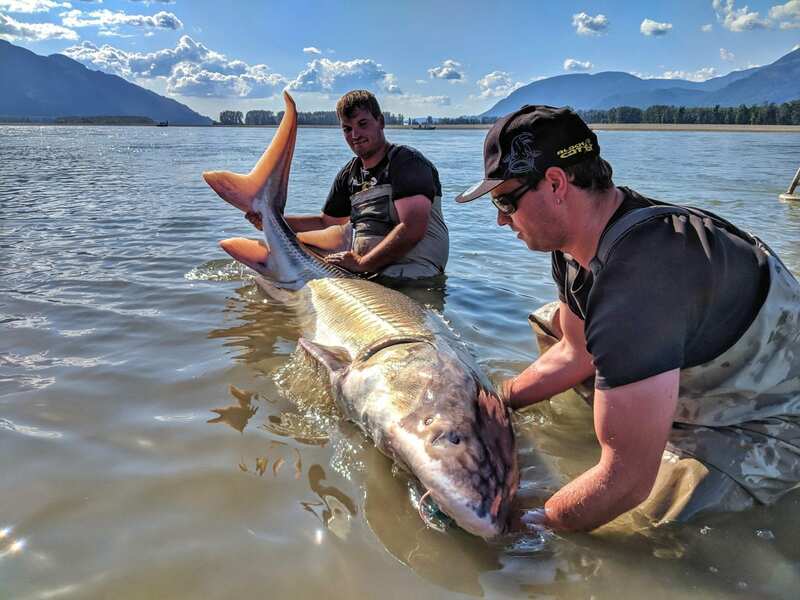 The Fraser river has a strict catch and release policy for sturgeon which has helped immensely with sturgeon conservation. This family all the way from Paris France caught a huge 8 ‘ 4” sturgeon making their voyage across the Atlantic all worthwhile. There will be plenty to brag about when they get home! Last but not least, the most badass fish we encountered was this 9’2” sturgeon after an epic battle battle. It was a long fight but well worth it. Look at this beauty! There’s still time to get on Fraser this summer and catch your very own dinosaur. Contact us to book your sturgeon fishing adventure.